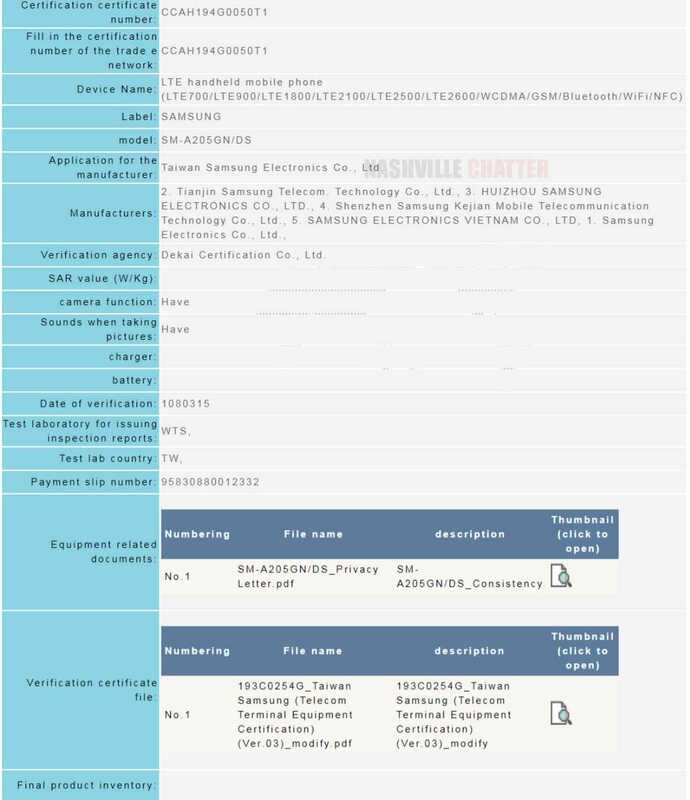 Samsung Galaxy A20 release is around the corner, as confirmed by the increasing certifications bagged by the phone in the last few weeks. The latest is the Taiwanese certification authority, the NCC agency. The phone has been listed here with its model variant SM-A205GN/DS. This device was seen on the benchmarking site Geekbench almost two months ago but that was for the model variant SM-A205FN. It has been in the public domain for some time that Samsung plans to release 9 smartphones in the Samsung Galaxy A series starting with A10 and going up to A90. The specs and features will also gradually scale up in the ascending order. Thus, the Samsung Galaxy A20 has to be seen in this perspective. But there is very little information on the specifications of the A20 device. From the Geekbench listing, we can make out that there is a 3 GB RAM present in the phone and the OS is the Android Pie. The processor used is the Samsung’s in-house Exynos 7885 processor. Apart from these, it has come to light that the phone may sport a dual camera setup in the rear and the 3.5 mm audio out jack is very much present. These have been revealed through the leak of a case meant for the Samsung Galaxy A20. And based on the other factors, it will be safe to assume that this new phone will be positioned as a budget category phone. Apart from the Taiwanese NCC, Indonesian TKDN and Geekbench, the Samsung Galaxy A20 has been sighted on the official Samsung site in the UK along with a couple of other devices, the A90 and A40, though for a short period. This confirms that the phone is due for release anytime soon, probably in April 2019. Meanwhile, the Samsung Galaxy A20 Support Page has gone live on Samsung Russia website. These should leave no doubt that the phone will be out in the market in a matter of days and that the phone will be launched in several countries.